If you’re needing a quality fence company in Cleburne, TX, you’ve come to the perfect place. At Ware Fencing, we provide all types of fence repair, fence replacement, and fence installation for residential in addition to commercial properties. With our services, we can work as a team to add to the property value of your home or property, as well as the curb appeal and safety! We are fence professionals, and no matter what your goal is with your fence, our team can help you achieve it. 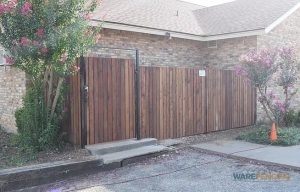 You can reach the crew at 817-948-4503 to discover more, and speak with one of our experts about your fence options. As a professional as well as local fence company in the Cleburne area, we have years of expertise servicing homes as well as businesses in the community. We even provide expert farm and ranch fencing services, carrying reliable fence solutions for cattle, horses, and more. We provide a selection of residential fence options including bamboo, aluminum, as well as iron, also. Cedar and aluminum are both popular picks from our home fencing stock, because they offer cost-effective affordable safety. For further home security, you can pick from our wrought iron fences, or ask about our specialty security fence options. Even if you need a custom fence design that you do not see listed here, you can rely on us for the perfect fence. Wood Fences Our wooden fences are available in a variety of choices, so you can find the ideal wood fence for your needs and budget. Iron Fences With an iron fence, you get beauty, as well a reliable security all in one. Aluminum Fences Aluminum fences are durable, as well as cost-effective, making them an ideal fence for your yard. Chain Link Fences Chain link fencing is easy to install, as well as affordable to purchase, making it ideal for permanent as well as temporary uses. Pool Safety Fences Keep children safe with a quality pool safety fence from Ware Fencing. Fence Design Didn’t find what you were looking for? We also offer custom fence design services! 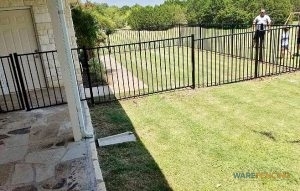 If you’re looking for a fence company in Cleburne, TX that you can rely on, look no further. Ware Fencing is committed to providing unbeatable customer satisfaction, along with utilizing top quality materials that are designed to last. Our team works hard to supply each client with the precise outcome they came to us for, and we look forward to serving you too. You can reach our team of experts at 817-948-4503 now to request a quote as well as set up as appointment! If you need a dependable fence company, you can count on us. Cattle Fencing Keep your cattle safe with a cattle fence from Ware Fencing. Pipe & Cable Fencing Pipe and cable fencing lasts for a long time, and is safe for containing horses! Barbed Wire Fencing Don’t worry about installing barbed wire fencing yourself, just give our team a call! Split Rail Fencing Split rail fencing is very affordable, as well as incredibly durable. Electric Fences Electric fencing is affordable, durable, and effective.